The Ottawa Senators have potentially lost their top scorer for the rest of the regular season, just two weeks after trading away their other top three scorers. Defenceman Thomas Chabot, 22, broke his toe when he blocked a shot midway through Monday's loss to the Philadelphia Flyers. Head coach Marc Crawford said Chabot, whose injury was discovered after he finished the last game, is out week-to-week. There is less than a month left in the season. The Sainte-Marie, Que., native has 13 goals and 36 assists in 62 games this season, leading the team in assists and points. Chabot is also among the top 10 NHL defenceman in goals and points. 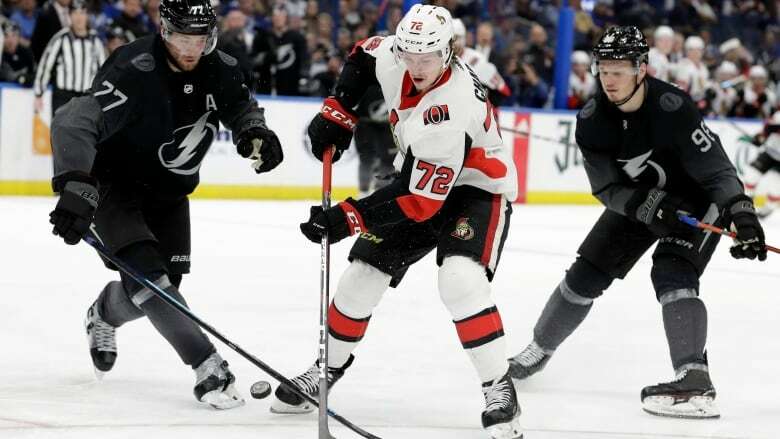 Chabot had become the team's leading scorer when Ottawa traded away top scorers Mark Stone, Matt Duchene and Ryan Dzingel prior to the NHL trade deadline. Crawford said he didn't think the injury would prevent Chabot from playing for Team Canada in the World Championships in Slovakia if he's invited to try out. The coach also announced newly-signed Max Véronneau will make his NHL debut Thursday against St. Louis. Gutted: What's left of the Ottawa Senators?